A powerful blast occurred outside a hotel in a high-security area near the Pakistan army's headquarters in the garrison city of Rawalpindi on Monday, killing at least 10 people and injuring several others. The explosion at around 10.40am caused considerable damage to the facade of Shalimar Hotel on Mall Road, a short distance from the army's general headquarters. Police officials said they believed the bomb was planted in a car or motorcycle parked outside the hotel. Several army officers' messes, sensitive military installations and other hotels are located near the building. Military police and paramilitary personnel cordoned off the area and diverted traffic from the road in front of the hotel. Ambulances and fire fighting vehicles rushed to the site to launch rescue operations. An emergency was declared in hospitals in Rawalpindi. Eyewitness and reporters of TV news channels said at least 10 people had died in the blast. An army officer was among the injured, they said. The attack came nearly a month after an audacious terrorist attack on the general headquarters in which 14 people were killed before most of the attackers were gunned down by army commandos. The blast comes as the army is involved in a massive offensive against Taliban militants in South Waziristan. 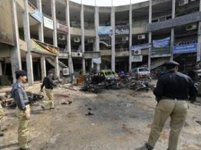 There have been several retaliatory attacks since the offensive began last month, including a deadly car bomb blast in the city of Peshawar on Wednesday that killed over 100 people.